Pamela Booton is a longtime Austin resident who is active as an arts advocate and financial consultant. She serves as founding director of the Alamo Bay Writers’ Workshop and Alamo Bay Press. Pamela was co-editor of The Amazing Imagination Vacation, project manager for the oral history documentary Seadrift Fishermen Legacy Project, and the organizer of the Texas Louisiana Gulf Coast Shindig. She is a consultant and agent for artist Reji Thomas and Graphic Glass Studio. She is also a consultant for the Mos Chukma Institute, which provides art therapy to children at the Dr. Martin Luther King, Jr. School in the Lower Ninth Ward of New Orleans. Pamela is an associate producer of the documentary Radio Taboo and promotes performances by artist/activist Issa Nyaphaga, providing community radio to Cameroon, West Africa. She is a member of Impact Austin and the Austin Documentary Fans and serves on the board of Issue TV. Pamela lives in Austin with her husband Javier VanWisse and their two dachshunds, Rudy and Grady. Diane Wilson, a fourth-generation shrimper, began fishing the bays off the Gulf Coast of Texas at the age of eight. By twenty-four she was a boat captain. In 1989, while running her brother's fish house at the docks and mending nets, she read a newspaper article that listed her home of Calhoun County as the number one toxic polluter in the country. She set up a meeting in the town hall to discuss what the chemical plants were doing to the bays and thus began her life as an environmental activist. Her work on behalf of the people and aquatic life of Seadrift, Texas, has won her a number of awards including: National Fisherman Magazine Award, Mother Jones's Hell Raiser of the Month, Lois Gibbs' Environmental Lifetime Award, Louisiana Environmental Action (LEAN) Environmental Award, Giraffe Project, Jenifer Altman Award, Blue Planet Award, and the Bioneers Award. Co-founder of Texas Jail Project, Diane continues to lead the fight for social justice. Her acclaimed writing captures the imagination and the conscience of us all. Lee Meitzen Grue is a Louisiana poet and fiction writer who often writes about New Orleans culture and music. 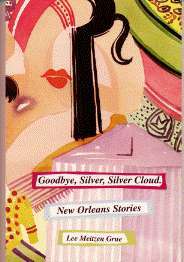 Her published books include Trains and Other Intrusions: Poems; French Quarter Poems; In The Sweet Balance of The Flesh; and Goodbye, Silver, Silver Cloud, a collection of New Orleans stories. As a Visiting Writer, she has conducted seminars and performed her work at La Universidad de Barcelona in Spain; at Librairie, an English language bookstore in Paris; at Westminster College in Fulton, Missouri; and at the University of Hawai'i at Manoa international symposium“The Literature of Place." She has translated the work of Mexican poet David Huerta as of “Bridging The Gulf,” an exchange of four Mexico City poets and four new Orleans poets. The recipient of an NEA Fellowship, prizes in poetry and fiction from Deep South Writers, The Associated Writing Programs, and a PEN Syndicated Fiction Prize, Lee has taught at Tulane University, Westminster College, and Xavier University. She is the former Director of The New Orleans Poetry Forum and The First Backyard Poetry Theater and long time editor of The New Laurel Review. Lee Grue remains one of the finest Katrina spokespersons of our day. Andrei Codrescu says, "Lee Grue's work is one of the majestic pylons that keeps New Orleans above water, a pylon woven thickly and subtly from the city's history. Her poetry weaves her personal history to the five centuries of the city's own, a fabric stronger than the dreams of engineers." Lowell Mick White is the author of three books: Professed and That Demon Life, novels, and Long Time Ago Good, a story collection. His work has been published in many journals, including Callaloo, Iron Horse Literary Review, and Short Story, and he’s won the Dobie-Paisano Fellowship, awarded by the University of Texas at Austin and the Texas Institute of Letters. Dr. White lived in Austin, Texas, for 25 years, at various times making his living working as a cab driver, as a shade tree salesman, and as an Internal Revenue Service bureaucrat. While teaching at Texas A&M University, he was also National Endowment for the Arts Artist-in-Residence at the federal prison in Bryan, Texas. Dr. White is Editor of Alamo Bay Press. In 2014 he was inducted into the Texas Institute of Letters. Born in the small town of Plaquemine, Louisiana, Dr. Hazel Ward is the recipient of numerous awards and honors, including the Woodrow Wilson fellowship and Ford Foundation grant. The literary and academic community has certainly benefited from her numerous highly respected publications and presentations. Dr. Ward has taught English at colleges and universities throughout the Austin and Houston area. Her career has taken her from Professor to Dean of Communications at Austin Community College. Dr. Ward is the ultimate educator, poet, writer and humanist. Each in its own way fulfills the many facets of her character. The educator is apparent in her desire to give back to students what she has learned, to inspire in them a thirst for knowledge, and to always do so joyfully and purposefully. The poet/writer in her is reflected in her deep and abiding love for language. The very last characteristic is the most difficult to define, as humanism is embedded in one’s everyday actions of respecting people, nature, truth and the intellect. Dr. Ward strives to do that on a daily basis as a good mother, a loyal friend, a supportive colleague and a thoughtful supervisor.